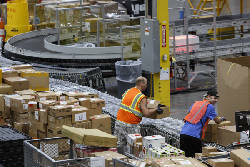 Visitors applying for jobs are given a tour of the Amazon Fulfillment Center in Enterprise South Industrial Park on Wednesday, Aug. 2, 2017, in Chattanooga, Tenn. Amazon held nationwide job fairs Wednesday to fill 50,000 positions as the company sees a surge in growth. Capital grant: A flexible state subsidy program in Tennessee that awards large sums to companies building new facilities. Nissan, for instance, received a $35 million capital grant to expand its Smyrna plant. Capital investment: The amount a company commits to spending on facilities, typically stipulated when applying for a subsidy. Clawback: A provision allowing a government to recover funds if a company does not meet its hiring or investment targets. 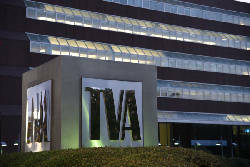 Department of Economic and Community Development: The state agency responsible for attracting business and expanding employment in Tennessee. Economic development grant: Awarded by the state, these subsidies can pay for a variety of business costs — from interior office improvements to relocation expenses for a company moving to Tennessee. FastTrack: The state's main economic development grant program, with annual spending topping $100 million. Under FastTrack, the state awards funds for job training, for public infrastructure, and for various expenses when a company expands or moves — like retrofitting office space. A grantee is only paid after it hires and trains (or retrains) workers, or in the case of building costs, after the funds are spent. For the job training grants, companies are paid after retaining an employee between three months and two years, depending on the grant size. Industrial development board: County or city agency that awards businesses tax-exempt bonds, tax abatements and other assistance. Infrastructure grant: A subsidy to help develop or redevelop a property. It can fund sidewalks, utility lines, roads and other public infrastructure benefiting the company. Job training grant: A subsidy to train employees for newly created jobs. Some grants are used to retrain current employees. Payment in lieu of taxes (PILOT): State law generally allows local governments to waive some or all of a company's property taxes for up to 23 years. Most PILOT agreements are based on a company creating new jobs and investing in facilities. Some PILOTs mandate companies pay a larger amount of taxes in later years if hiring goals aren't met. Site selection: The process of a company evaluating new facility locations. Some businesses use highly paid consultants to arrange subsidies from states and local governments. Subsidy: Government assistance for a company to create jobs and expand. In Tennessee, the most common forms are grants, tax credits and tax abatements. Also known as "incentives." Tax abatement: Waived taxes, typically for property (land, equipment or buildings). See "PILOT" above. Tax credits: A company can pay less in taxes in exchange for hiring workers, buying equipment or other actions that benefit the economy. Tax increment financing (TIF): Local governments award bonds to companies, which promise to repay the money with future tax revenue. TIF funding is intended to redevelop blighted areas.